ndian Navy has named its new sailing ship as INS Sudarshini on commissioning at a later date. The ship is a follow on class of INS Tarangini. 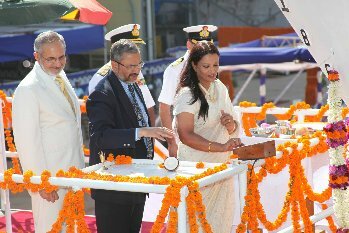 Sudarshini means “Beautiful Lady.” Smt Letha Sushil, her self a sudarshini, spouse of Vice Admiral KN Sushil, Flag Officer Commanding in Chief Southern Naval Command launched Navy’s next sail training ship at Goa Shipyard today.